We provide a full range of asbestos removal services to commercial businesses throughout the UK. 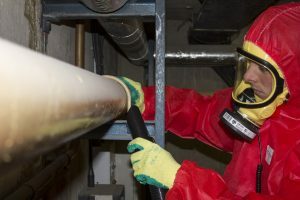 At Oracle Solutions, we have the capability and expertise to offer you the widest range of asbestos removal, encapsulation and remediation services available. With a large team of highly trained asbestos technicians strategically located throughout the UK, we offer genuine nationwide coverage. This allows us to react swiftly to all your asbestos needs. Our dedicated asbestos removal team includes highly trained site operatives backed up by a management team with over 200 years of combined industry knowledge. We are HSE-licensed, which gives you the peace of mind for us to carry out any type of asbestos removal, encapsulation, remediation or decontamination. If you’re looking for a truly expert solution to your asbestos removal needs, look no further! 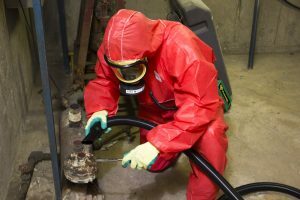 Below are answers to some of the most frequently asked questions about asbestos removal services. Can’t find what you’re looking for? ‘Contact us’ and we’ll be happy to help. Also, if you’re looking for information and guidance, this link Asbestos Law will take you to our Health & Safety Executive Free Guidance and Information Pages. Here you’ll find helpful asbestos essentials guides which may be useful. When should I get my asbestos repaired? Protection of repaired and encapsulated asbestos-containing material is usually undertaken in situations where the likelihood of accidental damage is quite high. Although it may be sensible to remove asbestos from such areas, repair can often be a more cost-effective solution – as long as adequate protection can be applied to reduce the risk of damage. This protection can be undertaken in a number of ways – for example, a timber or metal panel covering the asbestos, a purpose-built timber boxing, or even a metal barrier to prevent accidental damage by vehicles. Why should I use Oracle Solutions to remove or repair my asbestos? Oracle Solutions are licensed by the HSE to undertake all types of asbestos removal and repair. This ensures that any work we do for you is fully compliant with current regulations. We are fully insured and have the highest level of professional indemnity insurance. This means that when we give you advice, you have assurance that the advice we give is good advice. Our professional indemnity insurance is the highest available in the asbestos industry, and covers you for £5 million. Most other organisations either don’t have this type of insurance at all, or have a very low level of cover. Take a look at our home page. You will see that we have every accreditation, insurance, licence and membership available. This shows that you can trust our expertise and quality. With nationwide coverage and a huge team of highly experienced asbestos professionals, we can guarantee you a fast, accurate service. With Oracle Solutions, you get your quote, your project and your final report delivered on time every time. Our wide experience means you get the most cost-effective and legally-compliant solutions to all your asbestos issues. Do you need to be licenced by the HSE to work on all asbestos materials? Not all work on asbestos requires a licence, but a lot of activities do. However, even for work on asbestos materials which are not classed as ‘licensed’, you must still comply with all the relevant asbestos regulations. If you’re not sure what type of work you will require, call us and we’ll give you all the guidance you need. This is why most clients prefer to use a licensed contractor to work on all their asbestos products. The licence shows that the contractor has achieved the standard required by the HSE to undertake asbestos work. This gives you confidence that your contractor knows how to get the job done safely, legally and properly. By using a licensed contractor for all asbestos work, you can prove that you have carried out your due diligence in ensuring that the work has been completed in accordance with legal requirements. Oracle Solutions are fully licensed by the Health and Safety Executive to undertake all work with asbestos – including asbestos removal, asbestos remediation and asbestos abatement. We are also licensed by the Environment Agency to transport hazardous waste for disposal. All our staff are trained to the highest standards, which is delivered by ACAD (Asbestos Control and Abatement Division) or ARCA (Asbestos Removal Contractors Association). No. Asbestos must only be removed if it is likely to be disturbed, or if it is in a poor condition and cannot be made safe. Some asbestos materials can be so badly damaged that a repair is not reasonable or practicable. Also, if the asbestos material is likely to be disturbed during normal everyday activities (or other planned activities) then it should be removed to avoid accidental disturbance. The law says that if asbestos materials are to remain in place, they must be in a safe condition and managed in accordance with the law. Many people decide to remove asbestos wherever possible, to avoid any ongoing management costs and potential disturbance. However, many people manage their asbestos well. They always look to make it safe by repairing it, and in some cases protecting it. We can give you the best advice on asbestos management, repair, encapsulation, protection or removal. We will always talk you through all the available options, and guide you through the whole process. Call us now for expert advice. If you would like a fast and free asbestos removal quotation, please complete the enquiry form below and one of our team will be in touch as soon as possible. When will you need the asbestos removal completing?